Many homes in the Toronto, Mississauga, GTA region would benefit from basement lowering – but the question is, which is better – Underpinning vs Bench-Footing. 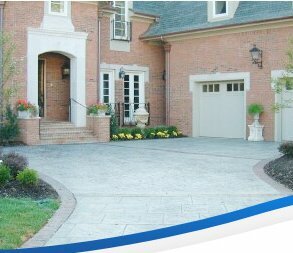 It is common to find very nice homes, especially the older ones – which were constructed with inadequate basements. If you have such a home, or are considering buying one, it IS possible to transform that inadequate “cellar” into a nice full basement. You shouldn't even consider lowering the basement until you have a clear understanding of foundation modifications. Any time you excavate to or below the depth of the footings, you weaken the structure of your home. This can cause permanent damage. Here are some of the advantages and disadvantages of the two common methods of basement lowering. Bench-Footing can be substantially faster and less expensive than Underpinning, but when it is completed, you will have a concrete “Bench” extending the full length of your wall. If the house was build on a hillside, the bench may have to be “stepped”, resulting in a less attractive living space. When you are considering the question of underpinning vs bench-footing, be sure that you can tolerate the appearance and space limitations which it imposes. If you can live with the cost of underpinning, the long term affect on your living space will be more pleasing, and when you later choose to sell the property, a properly underpinned house should command a better market price. Another important consideration is the condition of the existing foundation. A home with cracked or damaged foundations / footers can be restored to like-new condition through well done underpinning. Bench-footings do not change the existing foundations, so they don't solve such problems. While considering the choice of basement lowering: underpinning vs bench-footing, it is very important that the personnel doing the work be well qualified. If you are considering a do-it-yourself project, you probably shouldn't even THINK of underpinning. While well done underpinning is superior to bench-footings, it involves undermining and reinforcing the existing footings. Unskilled / inexperienced workmen can do permanent harm to your structure when they attempt such a task. Before you make a decision about basement lowering: underpinning vs bench-footing, you should consult with a well qualified contractor – one who has an established record of satisfied customers – one who will provide a written, long term warranty on their work. For basement lowering: underpinning vs bench-footing, call AquaResist Inc. We will evaluate your home and give you a written estimate of the cost. If we do the job, we'll provide a written 25 year warranty. 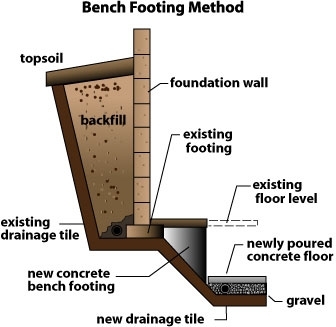 You can be confident that your chosen method of basement lowering: underpinning vs bench-footing is done right.